Jeremiah Maestre (photo: in the middle) was born in Manila, Philippines and moved to San Francisco when he was three. He grew up in the East Bay area in Contra Costa County. When he graduated high school he moved to Southern California to go to Vanguard University. There Jeremiah started training at a Mixed Martial Arts gym that his friend was working at. He quickly grew interest in the sport. He currently trains at No Limits MMA in Santa Ana mostly in BJJ and wrestling. 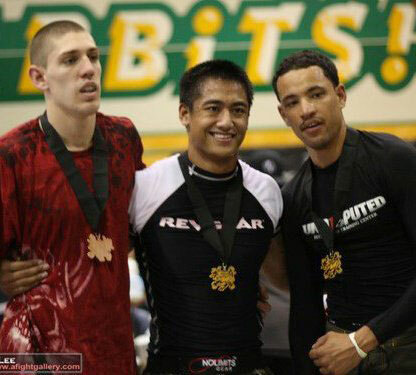 Jeremiah’s BJJ record is 7-1 and he’s a CAMO certified Amateur Mixed Martial Artist. He is now training hard to fight his first amateur MMA bout end of May.